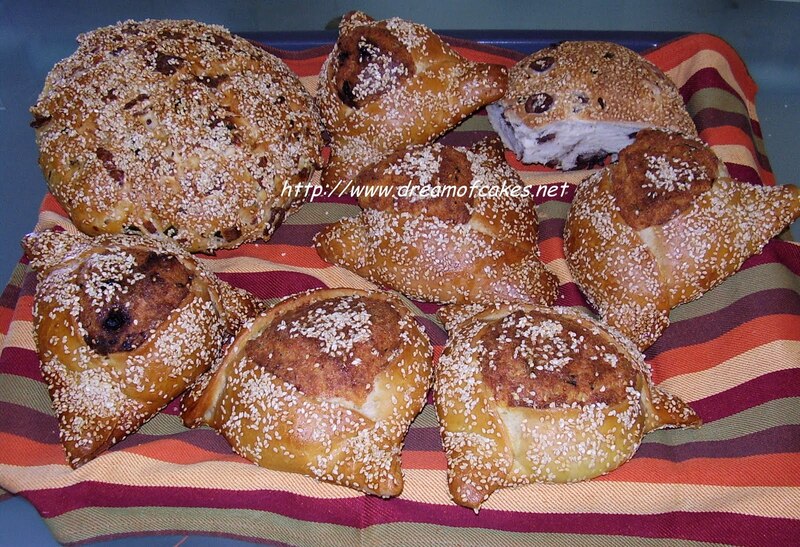 Flaouna is a traditional Cypriot treat that we bake few days before Easter. The main ingredient is cheese. The recipe varies from region to region. For example in Limassol and Paphos we use salty type of cheese but in other towns like Ammoxostos they use unsalted cheese and they add to the dough sugar and raisins. The other particularity of Flaouna is that each family has its own traditional recipe. For example my mother uses exactly the same ingredients as her mother did, my mother-in-law follows what her mother used to do and I guess I will do the same when I decide that it's time for me to get involved with this tradition. From what I know the ingredients that my mother uses are: flour, cheese, eggs, prozimi (special type of fresh yeast), salt, mastic, mahlep, nutmeg and fresh mint. The process starts days ago when my mother first prepares prozimi. Then, one day before the flaouna making, the cheese dough has to be prepared and allow to rest for several hours. The second day the “feast” begins. My mother, father, grand mother, aunty and however is available at the time has a role to play. I prefer not to get involved much, because it is a huge family process that has to end up giving the best results, so keeping a distance it is the wiser think to do :-). In the photo you can see flaouna or flaounes (in plural), a cheese bread and an olive bread that my mother baked today. There are flaounes where raisins were added to the dough as well. She was very proud for the result and I am very proud for her success! Kai tou chronou. They look wonderful and kudos to you mum for such lovely flaounes. I didn't know that you add raisins in the dough as well. In Larnaca they also make flaounes with sugar, which I don't like. I shall be making mine on Thursday. Kai tou xronou na ertheis na tis ftiaxete mazi me ti fili sou!! I personally don't like raisins but there are people who do, so my mother add them as a different option. What a lovely tradition. Now I know what flaounes are. Hey next year when you're the expert perhaps you can give us the step by step on how to make these. They look really good. I am loving all of these Easter breads and baked goods! Wish my family did stuff like this too! It is always interesting to learn other's tradition and these breads looks so delicious. I am a bread lover so any bread will pleases me. Look forward to see you get into the tradition and bake these lovely breads. I started baking breads this January and learned yeast can define the taste of simple bread. I'm so curious about prozimi yeast. I always love cheese bread though! What kinds of cheese do you use for this bread? Any special kind? The cheese we use for flaounes is a particular type of cheese that is made in Cyprus. It does not melt like the ones we use on pizzas. I am not sure whether you can find it abroad. I will try to find a similar cheese to these that you can find abroad and let you know. Looking forward to eating some this Pascha! Yum! Nice tradition to have...these look delicious! Put cheese in something and I'm sold! These look so savory! Just beautiful Eftychia! Those look so great. I love the mediterranean cuisine. I want to try it. Sounds like a true labor of love. They look delicious! Thank you for introducing this to me. Looks and sounds very interesting! I would love to try it out. Do you have a recipe? Dear Natascha thank you for your comments. Flaouna is a very complicated project due to the big quantities of the ingredients we use. I hope I will manage to have a recipe soon and I will share it with you for sure! Really enjoyed your post about such amazing family traditions. Lol on staying in the background ;-) The flaounes sound so delicious. I remember having lovely salty cheeses a long time ago on holiday in Cyprus. They look such a treat! Just love posts such as this! A little education and fun reading. These sound just wonderful - thanks for sharing. Wow, these look delicious! I love reading your blog to learn about Cypriot cuisine! 458 calories per 90gr, according to my dietitian!